Bring joy to your life! the sick and injured animals in need. services are available for community cats! Click here for more info about our FREE services! to a kitty in need! Lend a hand to help a paw. Come and meet our adoptables ! We have been helping homeless animals in Miami-Dade County since 1936. We offer programs and services to educate, inform, and inspire people to take responsible care of their pets and treat animals with the kindness they deserve. With the support of people from across the county, we are helping to create a better community for all. We are a private, not-for-profit, 501 (c) (3) charitable animal welfare organization supported solely by our programs and services, as well as donations, private grants and fundraising events. Please note: Our grooming salon will be closed on Saturday, April 27th. Become a foster parent. Be a hero. Get involved in our cause! Lend a hand to help a paw. Check out our Wish list. Every bit helps! Our Humane Education Program is instilling the values of kindness and compassion. We offer Free Spay/Neuter Services for those who qualify – or for a very low fee. 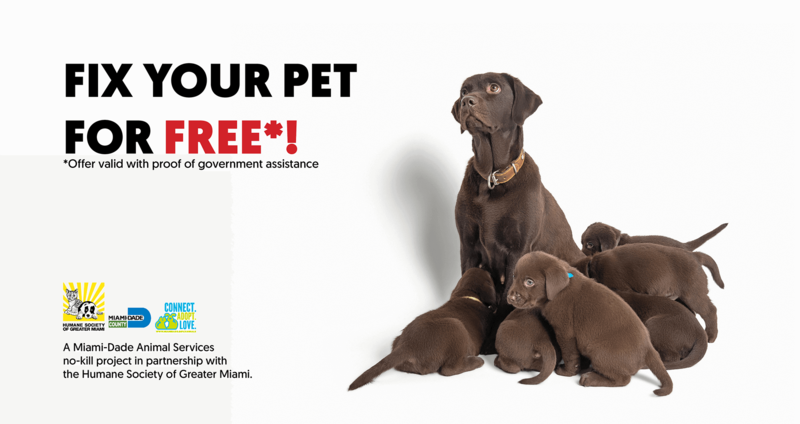 The Pet Therapy Program brings the unique and healing human/animal bond across Miami. Surrendering an animal to a shelter should be your last choice. Learn about all options. Sign up to receive our newsletter and get the latest news on upcoming events and specials!